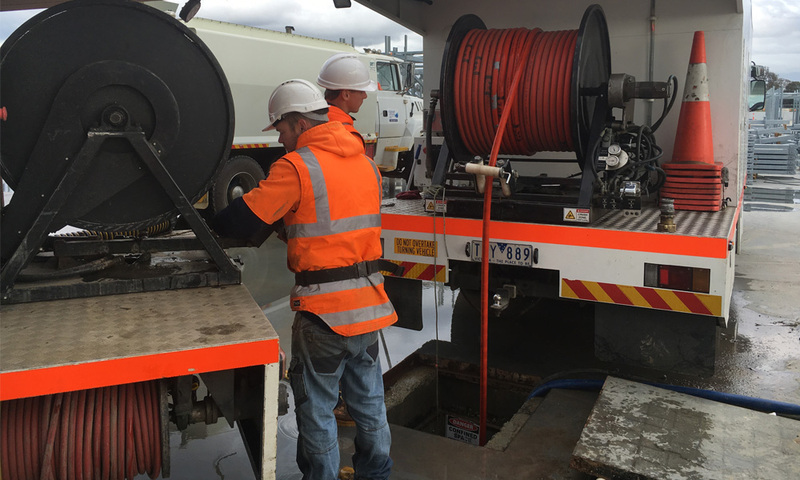 We recently completed a project at a large construction site in Dandenong South, the brief was to remove over 6 meters of 50mpa concrete from an ovalized 225mm PVC stormwater grade pipe. Concrete was approximately 50m upstream from pump well and pipe was not encased in concrete, the slab at ground level was approximately 800mm thick and was engineered to handle extremely heavy loads, cutting it was not an option. We were initially called to site to clear an unknown blockage that another contractor had attempted to clear unsuccessfully, we quickly realised the blockage was not clay or slurry and organised for our tractor camera to attend site. After viewing the footage, we realised it was concrete and started coming up with ideas to remove the blockage. After coming up with a few ideas to remove the concrete we eventually settled on making our own tungsten carbide cutting heads to adapt to our own high torque root cutter motors, as there is no nozzle or product that you can buy off the shelf for this problem, any impact or other cutting nozzle would smash the host pipe to pieces. After some trial and error, we settled on a design that removed concrete efficiently without damaging the ovalized PVC host pipe, something that seemed almost impossible when we started thinking about how we were going to solve the problem! After removing all the concrete and performing the final CCTV inspection we determined that a screw pile had gone through an aggi near the 225mm main line and the concrete had entered the drain through this location. The 225mm PVC was now entirely clear of concrete and in excellent condition with only some minor scratching to host pipe walls, and although it was a massive problem for the construction contractor we were able to provide a solution without cutting the engineered slab or digging up the pipe, something they wanted to avoid at all costs.